DESCRIPTION: Busy papers can be hard for me to use as backgrounds, but I've found a solution in the form of stitching! I used the Britt Bass Turner paper (#10) from Fancy Free as the background and then stitched a big'n'bold title on it. JOURNALING SAYS: How on earth can you already be three years old?! We actually celebrated your birthday a few days early since we would be on a cruise on the real day. 1st birthday in a hotel and 3rd birthday on a boat! HOW TO: Use a Silhouette Cameo to draw a large phrase onto a bright and colorful patterned paper. Pierce holes every 1/4" all the way around the phrase then backstitch through using your choice of thread color or colors (I usually use white so for a change of pace I went with a dark gray). Add a photo to the bottom left corner. Embellish with a wood veneer frame, date stamped tag, "to" Thickers, and a little die cut heart. Add "x" puffy stickers across the stitching. Embellish the top right corner with a few bits and journal inside one of the stitched letters. Loveeeeeeeee this! LOVING that adorable photo, the way you journaled in the letter and that stitching is FABULOUS!!!!!!!!!!!!!!!!!!!!!!!!! 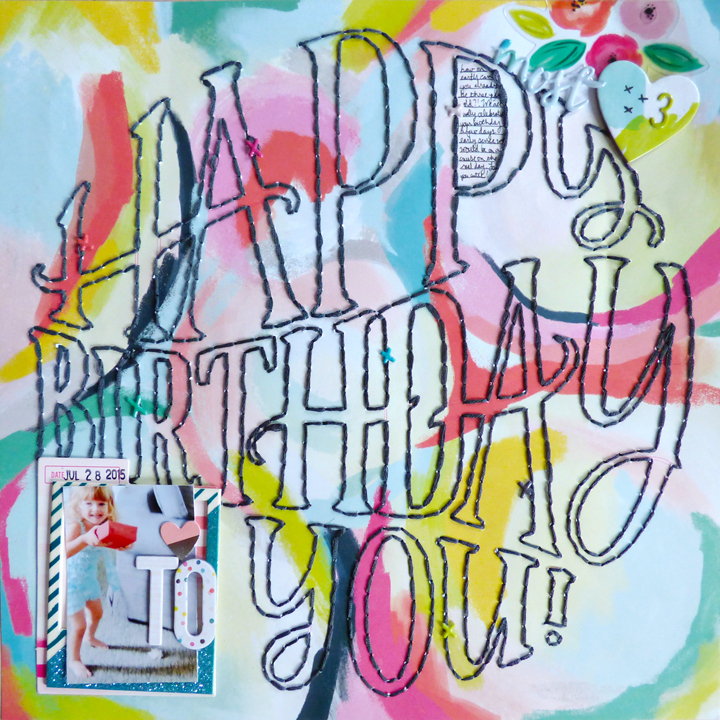 Fancy Free in Scrapbook & Cards Today!